Although a healthy, balanced diet is important at any time in life, once you become pregnant it becomes even more essential to ensure you’re eating right. Both you and baby need specific nutrients, minerals and vitamins to ensure a healthy pregnancy. If you don’t get enough of these key nutrients, it could have a significant impact on baby’s development. So, what exactly should you be eating? Here, you’ll discover the top 10 foods to eat during pregnancy. Broccoli, and in fact all leafy greens, contain essential nutrients which are vital during pregnancy. These include folate and calcium. However, broccoli also contains a high fiber content and antioxidants which are renowned for fighting off diseases. Constipation can be a real issue for pregnant women, so increasing the amount of fiber intake in your diet will help to prevent this uncomfortable side effect. Anemia is another tough side effect of pregnancy, but broccoli can help combat it thanks to its high iron and folate content. Other benefits of this super vegetable include it helps to regulate blood sugar levels, it strengthens the bones, boosts immunity and prevents birth defects. It’s common for women to cut out fish from their diet altogether once they discover they are pregnant. Experts warn over consuming certain types of fish due to its high mercury content – something which can prove dangerous to baby. However, it is perfectly safe, and crucial, to consume a little fish during pregnancy and one of the best fish you can eat is salmon. Salmon contains a high level of Omega 3 fatty acids which are known to be important for baby’s development. It contains very little mercury compared to other types of fish, making it safe and recommended to be consumed twice a week. It is important to note however, that not all salmon has a low mercury content. It all depends upon what the salmon has been fed throughout its lifetime. That’s why, it’s much safer to stick to buying wild salmon, rather than the most common farm raised varieties sold at grocery stores. You may already know that folate is important during those initial few weeks of pregnancy. However, did you know it’s actually important to maintain a good level of B vitamins throughout the entire pregnancy? It’s been recommended by experts that pregnant women should consume approximately 400mg of folate each day through fortified foods or supplements, along with 200mg a day through natural food sources. Fortified cereal typically contains up to 400mg of folate alone, making it one of the best ways to ensure you’re getting your daily recommended dose. Natural foods which contain good levels of folate include black eyed peas and asparagus. Bananas play two key roles during pregnancy. Firstly, their high potassium content provides a quick energy boost which is excellent at fighting off fatigue. It’s common to suffer with severe fatigue during pregnancy, especially in the initial stages. So, stock up on bananas and fight off that fatigue! Secondly, bananas can also help to relieve nausea, another common pregnancy side effect. This benefit alone makes them worth adding to your daily diet. Pregnant women need to consume around 10g of extra protein each day. Beans, particularly dried beans, along with lentils, both have an excellent protein content. They also come with the additional benefit of containing a high level of fiber. This helps to eliminate constipation. Approximately just one cup of cooked lentils will meet half of your daily recommendation of folate too – an essential nutrient required during pregnancy. Dairy products are really important during pregnancy. The body starts to absorb double the amount of calcium it usually does to accommodate your growing baby. It’s been discovered that many women already don’t get enough calcium each day, so it’s highly likely you’ll need to up your intake during pregnancy. Nonfat milk is a great way to boost your calcium intake. It’s estimated that each 8oz glass of nonfat milk provides around 30% of your recommended daily calcium intake. Yoghurt is another great calcium source, and it has the added benefit of containing folate and protein. If you opt for yoghurt which contains good bacteria, you’ll also help to fight off yeast infections, which can be common during pregnancy, and reduce the risk of stomach upset. Sweet potatoes are a power food for pregnant women. These simple, orange colored vegetables contain many essential vitamins and nutrients required during pregnancy. They contain more than the recommended daily intake of Vitamin A, a high level of fiber, iron and vitamins C and B-6. So, this awesome vegetable has the power to reduce constipation, prevent morning sickness, aid in the absorption of iron and generally ensure you and your baby are healthy. One thing you really need to increase in your diet when you’re pregnant is iron. Your iron requirements practically double when you’re carrying baby, yet it can be difficult to ensure you’re getting the right amount. That’s where lean meats come in. It’s best to opt for meats which are between 95% to 98% fat free. Pork and beef are especially important as they also contain choline – something which is really important during pregnancy. One thing worth mentioning here is you should avoid eating hotdogs or deli meat as both can contain parasites and bacteria if not cooked properly, which could prove dangerous to both you and baby. Up until recently, pregnant women had been advised to avoid eating eggs during pregnancy; particularly raw or runny eggs. However, there’s been a change in the official guidelines, with experts now claiming runny eggs are safe to be eaten while pregnant. Eggs contain a high level of protein, so they could be used to replace some meat sources if required. Many pregnant women find meat nauseating, so it’s good to have an alternative source to ensure you and baby are getting adequate protein levels. Avocados can be counted as another power food during pregnancy. They’re packed full of essential nutrients your body needs to stay healthy such as potassium, Vitamins C and B-6 and folate. They’re also known to combat morning sickness. However, avocados do have a high level of fat (albeit healthy fats) and calories so they should be eaten in moderation. Although, if you’re struggling to gain weight during pregnancy, avocados can help if eaten as part of your daily diet. 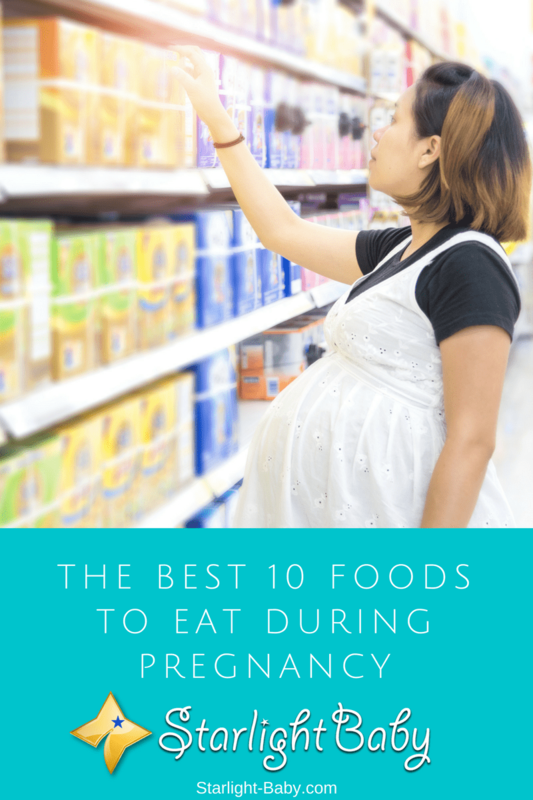 So, there you have it, 10 of the best foods to eat during pregnancy. Before making any dietary changes, it’s worth talking it through with your doctor. They’ll be able to give you a better idea of the type of diet you need to follow according to your individual requirements. Avocados prevent not only congenital diseases in the nervous system, but also problems in the spina bifida, like the poor closure of the fetal spine. It’s such a wonderful food for pregnancy and all pregnants should eat it! Great post! I’m on bed rest for my last few weeks and my crockpot has been a lifesaver. Sweet potato roast has been a favorite of ours, and of course beans and rice can last for a few days in our family–I throw the ingredients for the beans together in the crockpot, and hubby makes the rice. I’m going to try to look up some lentil recipes now–I had no idea they had so much folate! I used to attempt a lot of recipes with lentils years ago while going through a health kick, but I never really succeeded. It is a known fact that every pregnant woman requires food in order to have a healthy pregnancy period as well as to have a smooth delivery of the baby for eating balanced and the necessary food can go a long way in ensuring that both the baby and the mom will be in hearty condition after the delivery. Taking eggs and lots of fruits such as banana is important for it contains some nutrients important for the baby to develop well. True… healthy food is a must to have a healthy baby and mommy. Eating the right foods ensures less, if not the absence, of pregnancy complications. The body requires a lot of nutrients during pregnancy so moms should not neglect this need. When my wife was pregant, she developed a strange food habit. Usually she loves fish, meat and eggs, however, during her pregnancy, she kind of disliked eating meat products. When I forced her, she even vomitted. Since she did not want to dishearten me, she ate fish, egg and meat once in a while, however, through the 9 months, she generally avoided meat products. Yes, this is one of the weird things that happen to a pregnant woman – foods they eat before becomes bad to the taste. Blame it on hormonal change, haha. It’s good she supplemented her protein needs with other foods. I’m so fortunate that when I was pregnant I do not have any food aversions. Avocados are abundant in my country and it’s a good snack to fill up that hunger every once in a while. The only thing I miss during pregnancy and after giving birth and breastfeeding is coffee. I kept track of every food I take since I almost had a gestational diabetes. The careful diet plan I did is all worth it. My baby is not so big so I didn’t had a hard time pushing him out. He’s lean but a long baby. In less than a month he gained so much weight because of breastfeeding too. Wow! You are one of the lucky few who never had issues with food. I wasn’t lucky like you. I would sometimes vomit if I find a food offensive to the smell or taste. Good job for watching what you eat when you were pregnant. That only means you love your baby big time and took good care of him when you were pregnant by avoiding foods that could cause gestational diabetes. Pregnancy food is a fun topic. I remember an experience with my pregnant friend. She was so late in her pregnancy that she already had this crazy list of foods to eat. She calls it her sudden cravings. And she would get so mad when her husband or anyone couldn’t get what she requested. Sometimes she would cry. But it’s pretty normal. We would laugh about it every now and then whenever we hear about other pregnant friends. @Steve, I think you have a point by saying that pregnancy period are special times for moms to have some cravings for some type of food and I’ve come to notice that moms are always emotional when it comes to period like this. Some of the pregnant mothers will even have dislike for aroma of some type of food and it makes one wonder why it is like that. You’re right, Steve and Henrywrites. Women are particularly sensitive during pregnancy – they would cry at the most simple issues, haha. Again, blame it on hormonal change. Even the heightened sense of smell and hate for some odor is due to hormones says experts. It’s important that men understand these conditions when their wives are pregnant. They’re not acting up and hate it as well but they can’t do anything about it. Yes thats rights all the food in your list are very good to the pregnant mother,but not all pregnant mother can eat,for me sometimes the food good for our baby we cant eat because we are looking our good taste that we love! Yes, that’s true. That’s the predicament of a pregnant woman – no matter how nutritious the food is if her stomach churns when she smells or tastes it, then she can’t eat it at all. One has to really find alternative nutritious foods sometimes just so she can feed herself and her baby something nutritious. These topic is so great. I can’t just imagine that during my 2nd pregnancy most of the list are not the like of foods I wanted on my meals. During my 1st trimester it was a disaster that I don’t even like the smell of garlic which is always present every time I cook for my family. I’ve lost weight during that period, but during the next trimesters was fine my love of food came back. All you need is to have control on what you eat during pregnancy because the more you eat the more you gain and the more the baby inside get big which is not good I think because you might have difficulties on delivery.